Adam's Big Pot is a cookbook for modern families. In his latest cookbook, Adam Liaw shows you how to prepare easy family meals and gives new answers for that age-old question: 'What's for dinner?' In this beautifully photographed cookbook, Adam takes a practical and creative approach to family cooking, creating new flavours from ingredients you already know, all in just one big wok, pan, dish or pot. From fresh Vietnamese salads and simple South African curries, to Korean grilled pork belly and one-pot Japanese classics, the dishes in Adam's Big Pot are basic enough for the novice home cook, affordable enough to feed the whole family, and can all be made from basic supermarket ingredients. Whether you're after easy classics like shaking beef, mee goreng and lamb vindaloo or looking to add new dishes to your repertoire like tiger-skin chicken, snapper rice and Japanese souffle cheesecake, Adam's Big Pot is your guide to simple, creative family cooking. 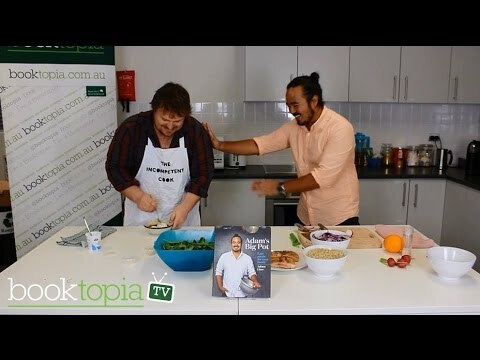 Adam Liaw is an Australian MasterChef winner, author and UNICEF Australia's National Ambassador for Nutrition. A former lawyer, Adam worked in the corporate world for more than a decade and is acutely aware of the challenges facing the working cook. His best-selling debut cookbook, Two Asian Kitchens, and its follow up, Asian After Work, were praised by critics and food lovers alike. A regular contributor to numerous publications including The Sydney Morning Herald, Feast magazine and The Wall Street Journal's Scene Asia, Adam also hosts the popular SBS television food and travel series Destination Flavour and Destination Flavour: Japan. He lives with his family in Sydney, Australia. This book is great. The recipes are easy to follow & uncomplicated. South Korean recipes are excellent. Well worth it, in my opinion. I bought this for my daughter-in-laws birthday and she loves it. I had a flick through it and now I'm definitely going to have to buy a copy for myself.